The simplest way to understand closures is by realizing what problem they are trying to solve. Let’s take a simple code example with a counter being incremented 3 times inside a loop. When the anonymous logging function gets executed, how can it have access to the variable ‘i’? Such a function with ‘memory’ about the environment where it was created is simply known as: a Closure. 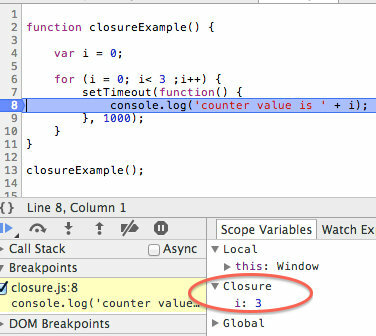 The simplest way is to use the Chrome Developer Tools debugger, and set a breakpoint in line 7 of the code snippet above. As we can see, the closure is just a simple data structure with links to the variables that the function needs to ‘remember’, in this case the i variable. This is not a bug, it’s the way closures work. The logging function is a closure (or has a closure, as the term is used in both ways) containing a reference to the i variable. This works because when calling asyncOperation a copy is made of the counter value, and the logging will ‘close over’ that copied value. This means each invocation of the logging function will see a different variable with values 0, 1, 2.